Cicak Man 3 (2015) - Sci-fi-central.com. Malaysia  2015   Directed by: Ghaz Abu Bakar, Yusry Abd Halim.  Starring: Zizan Razak, Lisa Surihani, Fizz Fairuz, Bell Ngasri, Yus Jambu, Adam Corrie, Rykarl Iskandar, Azizah Mahzan, Rashidi Ishak, Sathiya.  Music by: Edry Abdul Halim. Cicakman, the former superhero of Metrofulus had disappeared with people claiming Cicakman is dead or has retired. In his absence, the new superhero known as SuperBro has emerged and become the former defender of Metrofulus. I went into this flick not expecting much. I'm not an Cicak Man fan so I was not waiting in anticipation for this as much as I wanted to see Age of Ultron. 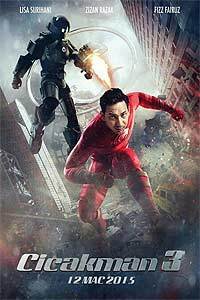 The character that Zizan Raja Lawak plays in this movie is not the Cicak Man I wanted to see, and Fizz Fairuz' role as Inspektor Adam, the original Cicak Man only made me want to see him dawn the suit even more, cause Fizz Fairuz was everything a superhero should be in this movie, Charming, really good dialog, and ready for action. Overall, Cicak Man 3 surprised me. It was one of the more unique superhero movies out. Cicak Man did things far beyond just punching and kicking that a lot of superheroes are doing on the big screen and went places no other super hero could go making for an action packed adventure. As cool as Cicak Man was when he was regular size beating up the bad guys, was as good as when he was shrunken, riding and controlling ants in a world only he can go to. Review by Mahmoud-Buttrumps from the Internet Movie Database.